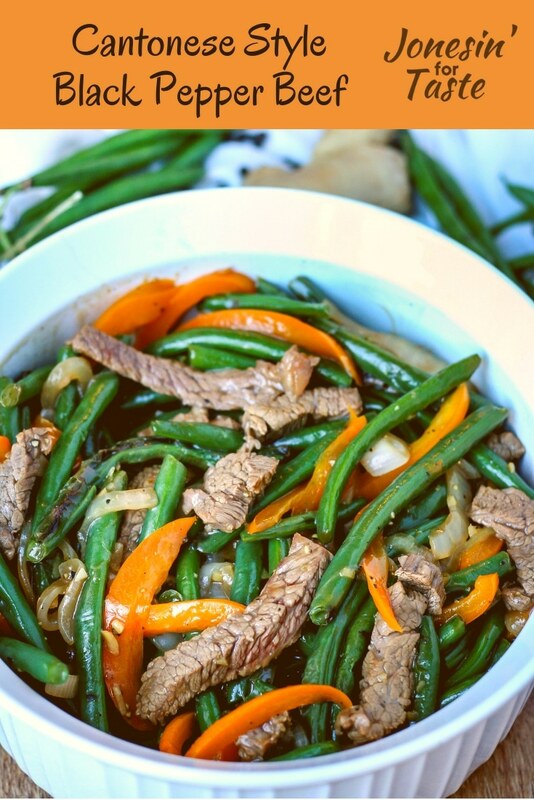 Cantonese Style Black Pepper Beef made with steak, onions, peppers, & fresh green beans for a main dish way better than take out & ready in under 40 minutes! Ordering take out always sounds good in theory but I’m generally let down by what we end up getting. It is really so easy to make your own take out at home and the best part is you get to control what goes into it. 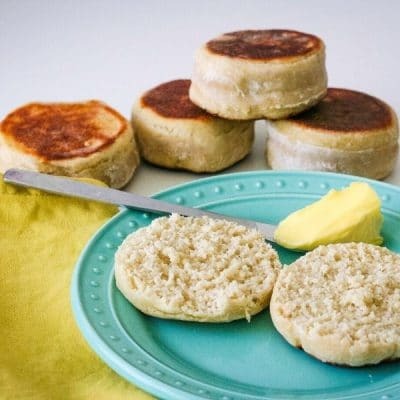 Not sure if your family will be interested in trying something new like this dish? 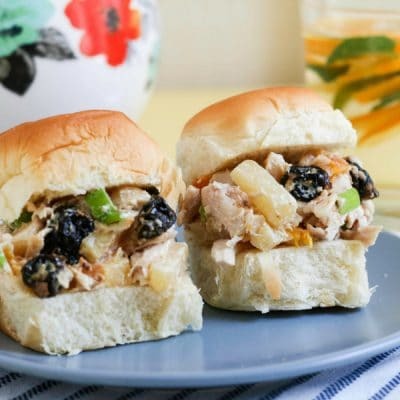 Visit my kid-friendly Asian food guide for tips, tricks, and resources to help introduce new foods to your family. This black pepper beef has a ton of flavor with such simple ingredients. The coarse grind black pepper is key to this particular dish. 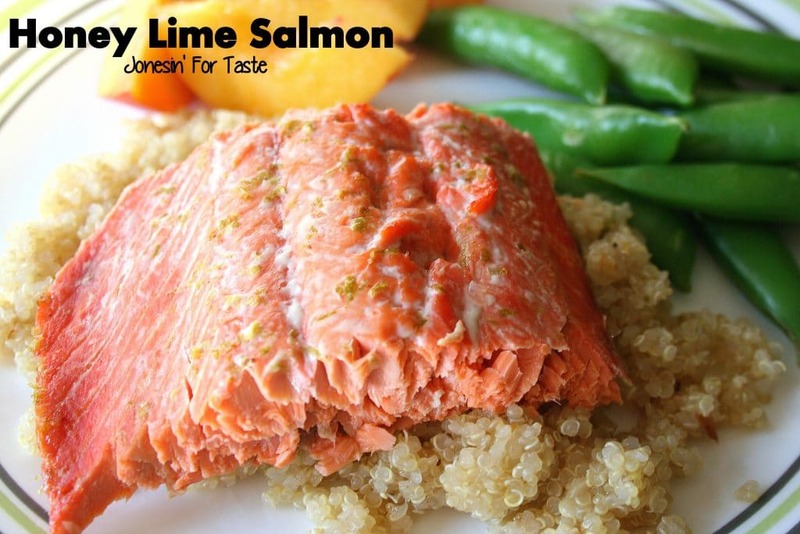 It balances the sweetness with that kick of spiciness from the chunks of black pepper. 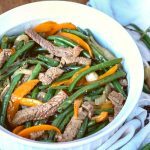 What to serve with Black Pepper Beef? 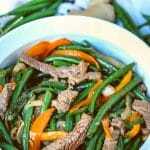 Serve the black pepper beef over steamed white rice, or next to it for most children. I usually serve dishes like this up with an additional side dish of vegetables. Steamed broccoli or edamame are a popular choice with children since they are vegetables they are familiar with. Adding lots of veggies to the main dish, and then serving additional vegetables on the side is a great trick to get your family to eat more veggies and give children more choices. Meat is made up of long muscle fibers in small bundles. The grain is the muscle fibers in the meat and cutting against the grain results in a more tender piece of meat. Cutting with the grain results in long strips of meat that are difficult to chew. To locate the grain, look at the end of the meat and look for lots of small short groupings. Refer back to the top picture in this post and you can see the short grains which results in nice and tender meat. 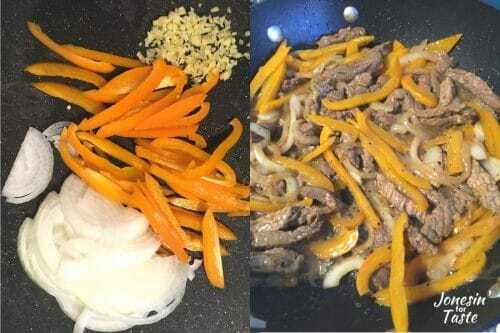 How to make black pepper beef? Make the sauce. Slice flank steak against the grain. Add the meat to the sauce. Trim the ends off the green beans. You can use a knife to cut off the ends or you can simple bend each end and they will naturally break. Slice peppers, onions, and mince ginger. Heat oil over a pan and add the green beans. 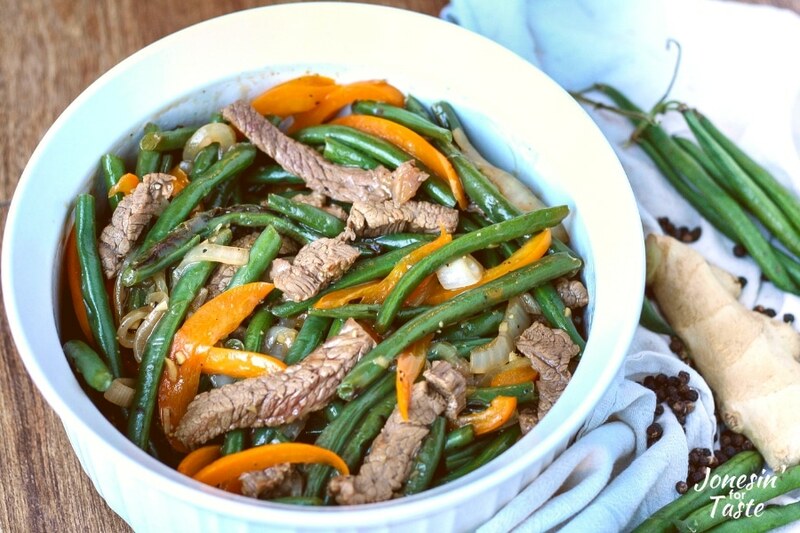 After stir frying for 1 minute, add water, cover pan, and steam green beans. Remove from pan. Heat additional oil and stir fry the peppers, onions, and ginger. Cook for 2-3 minutes and then add the meat with sauce. Continue stir frying the mixture until the beef is no longer pink. Return the green beans to the pan and heat through. Other recipes like Black Pepper Beef? 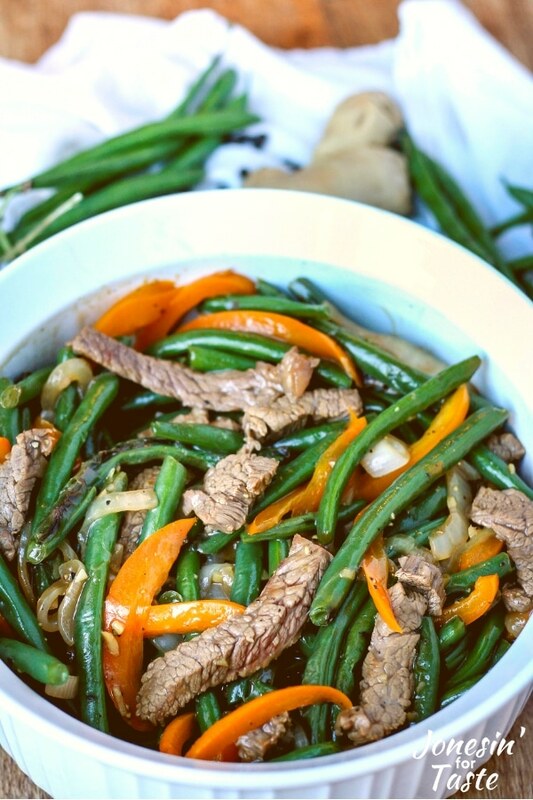 Cantonese Style Black Pepper Beef made with steak, onions, peppers, &fresh green beans for a main dish way better than take out & ready in under 40 minutes! Cut green beans into 2 inch long pieces. Pour soy sauce, cornstarch, rice vinegar, sugar, and black pepper into a bowl. Mix well. Slice steak with the grain into 2-inch-wide strips. Then slice the strips across the grain into thin slices. Place in bowl. Using your hands, toss the meat and seasonings together to mix well. Heat 1 Tbsp oil in a wok or stir fry pan over high heat until hot but not smoking. Add green beans and stir for about 1 minute. Add water and reduce heat to medium. Cover and cook until crisp-tender or about 6-9 minutes. Add remaining oil to pan and increase heat to high. Add ginger, onion, and peppers to pan and stir constantly for 2-3 minutes. Add beef mixture and cook until meat is no longer pink, about 2 minutes. Return beans to pan and mix well until heated thoroughly, about 1 minute. I agree with you when it comes to adding the vegetables into the main dish as opposed to them just being sides. That’s why stir-fries are so great in my opinion! We eat less meat and more vegetables, which is a win-win! 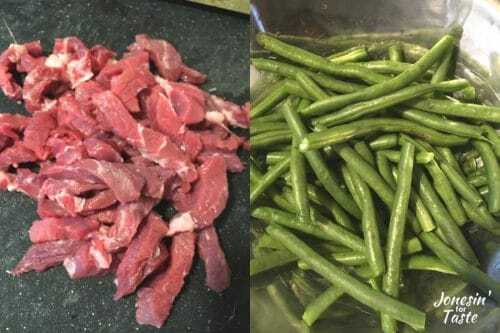 Thanks for linking up this recipe to Farmer’s Market Friday, green beans just started showing up 2 weeks ago and will be going strong throughout summer into fall. I am so excited for the summer produce explosion! It is seriously the best time of year for cooking. 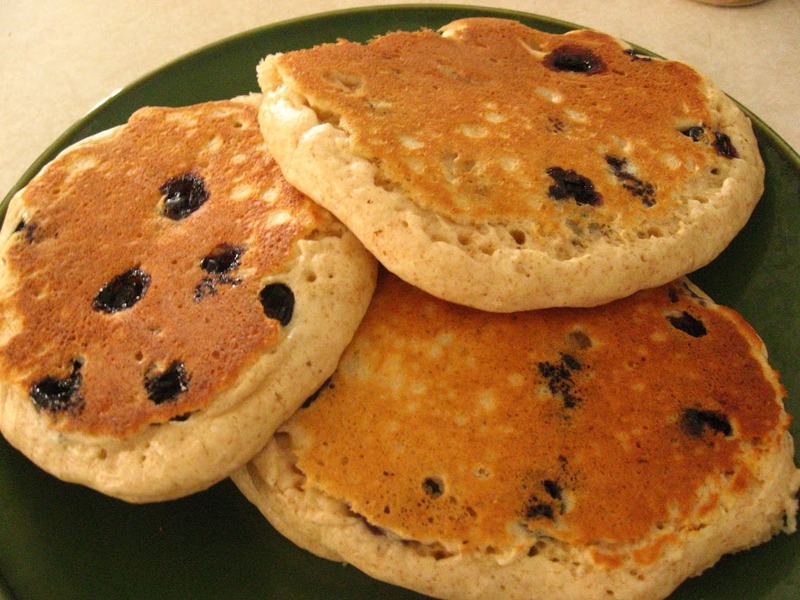 Thanks so much for linking up with Tasty Tuesday!